In less than two weeks, our electric has been out three times. And WHY has our electric been off so often in such a short space of time?? It’s been taken out by squirrels. I kid you not! It’s all a part of the Squirrel Wars. They seem intent on putting us in the dark. Leaving us without electricity. Removing our means of modern conveniences such as light, refrigeration, heating and cooling. And gasp! Without computers and internet access!!! What is their fiendish plan? Whatever it is, they seem willing to die for it! You see, our pasture has become a SQUIRREL DEATH ZONE!!! Seriously. Now we had nothing to do with it. We did not set up traps, or otherwise try to find any way to reduce the squirrel population. And it is sizable! They love all our big oak, walnut & hickory trees and the resulting acorns and nuts. However, we are quite willing to let them munch up on the nuts and run around in the trees without interference. In other words, we are not the ones waging war on the squirrels. What has changed for whatever reason is the squirrels behavior. All of a sudden we seem to have Kamikaze Squirrels. Or maybe Suicidal Squirrels. These critters seem hell-bent on self-destruction. And how are they killing themselves? BEWARE SQUIRRELS! ALL DIE WHO TRESPASS HERE! Yep, for some reason lately, the squirrels have been hopping from a tree to the transformer. Then there is a loud CRACK POP sound… and another squirrel has met its’ demise and gone to that great Squirrel Spa in the Sky… and taken our electricty out in the process. 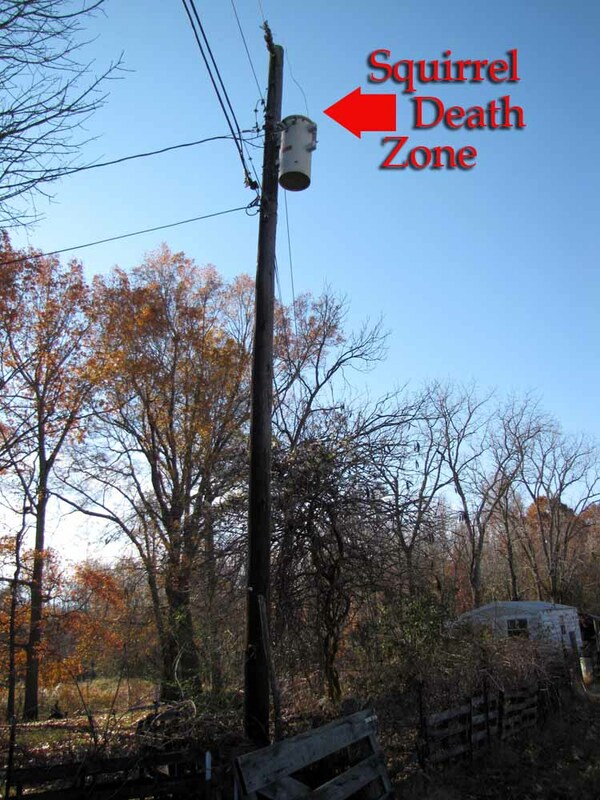 The Law says that hopping onto the transformer is an offense that merits the death penalty. That’s just one of the laws of nature or science or whatever you want to call it, but the sad facts are that little squirrels cannot hop onto an electrical contraption and survive. Nope, one good zap and they’re done for. Transformed from live squirrel to dead meat. Which means I have to call the electric company once again and report an outage. And once again they have to come out and remove the fried squirrel from the top of the transformer and reset some switches so our electric will come back on. Fortunately, the electrical guys maintain a sense a humor. They told me no matter how much they try, they haven’t been able to train the squirrels to wear protective gear when hopping onto electrical transformers. Maybe we need a warning sign for the transformer, but since the squirrels don’t read that’s not going to help much. Perhaps an audio recording that says “Beware! Squirrel Death Zone!” would do the trick. Check It Out! Our Small Farm Website Has a New Look!